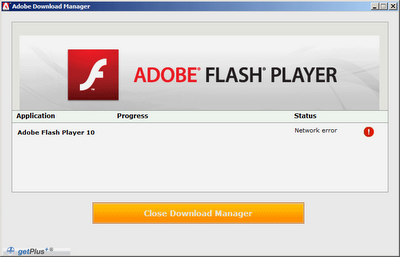 With the Firefox 3.5.5 update I was prompted to update my Adobe Flash Player to version 10. I went through the process with the Adobe Download Manager but only got as far as Status "Connecting..." and then "Network error". I found a complete download at the Adobe Flash Player Support Center. Under the Flash Player 10 section I downloaded the Adobe Flash Player 10 Update for Windows and Macintosh (ZIP, 44 MB) and installed the plugin from flash_player_update3_flash10.zip\Players\Release\Install Flash Player 10 Plugin.exe.